We reached out to some friends who know a lot about building a financially resilient business to get their thoughts on how leaders can lay the foundation for a successful business today – and in the future. 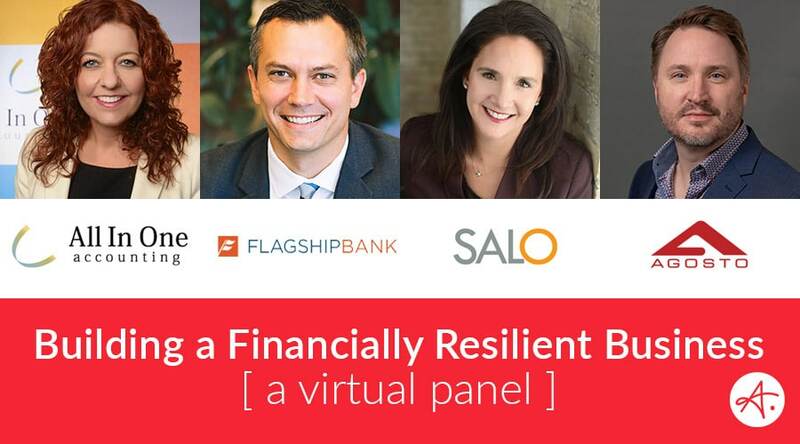 Welcome to this edition of Authentic Brand’s “Virtual Panel” series: Building a Financially Resilient Business. This Virtual Panel features a Q&A exchange with four business leaders who will be presenting more thoughts on this topic during ACTION19: a mini-conference for visionary leaders and their teams. We’re excited to be showcasing these leaders during this half-day event. Tickets are selling fast. If you haven’t registered yet, click here to register now and join us on March 7th to hear more! Q1: Why do you think it’s important for business leaders to be thinking about recession right now, in the midst of boom times? (AMY) A business leader’s job is to anticipate what is around the corner and prepare for multiple scenarios whether they are good, bad or indifferent. While uncertainties like the government shutdown, Brexit, and a possible trade war with China continue, the likelihood of an economic slowdown increases. Business leaders build trust with their employees when they are on top of business conditions – it is their role to promote and support growth in good economic times, as well as prepare their companies for slowdowns. Q2: All of you are seasoned leaders who have seen a few economic ups and downs in your day. If you think back to the most recent 2008 recession, what would you say is the biggest lesson you and your team learned through the fall-out and subsequent recovery? What did you see coming, and what was a surprise to you in terms of impact to your business? (ARIC) Often the best and most desirable people for a particular role are already employed and need to be recruited away. The biggest impact post 2008 recession was how many potential employees were reluctant to change roles, especially to a role in a smaller company. We grew pretty significantly starting in 2009 and this reluctance presented a hard challenge to recruit talent. Candidates really weren’t interested in any uncertain moves. To solve for this, we hired a full-time recruiter. We focused on creating a unique interview experience and we dramatically increased our employment benefits. Despite these changes, we still had challenges from 2009 through 2012. By 2012, the economy was better and most employees had ‘forgotten’ most of the uncertainty. (AMY) Cash is king and it’s important to have enough on hand. In the last recession, the drastic and immediate lack of liquidity created many issues. For example, at Salo we faced an issue with clients that used large vendor management systems (VMS). Some companies decided to switch from a 90-day payment term to a 180-day term, while others went bankrupt and never paid. This created tight cash flow since we were paying our employees every 2 weeks. Fortunately, we were well capitalized, however, it still made times challenging. At the time, we didn’t fully understand the depth of the challenges in the 2008 recession but in hindsight, we learned that when times seem too good to be true (think lending with negative amortization) they are probably too good to be true. Q3: What sorts of things would you recommend businesses start doing now that will help put them in the best situation if a downturn does happen? (ARIC) One of the best tips I got early in my career was to build a weekly cash model that goes out a reasonable amount of time. We have a weekly cash model that goes out two years. Based on our recurring revenue model, we can model assumptions and timing of renewals and projects. This gives us a pretty good picture of what our business will look like at the end of the year and next year. In anticipation of a recession, we can adjust receivable assumptions as clients try to stretch their payables out. This does a number of things: 1) gives us an ability to manage cash and see if we need to make any adjustments while there’s still time to adjust, 2) gives us an ability to plan for growth / investment while many people are trying to simply weather the storm, and 3) allows us to give our banker confidence in our financial management. Anyone that’s been through a recession knows that bankers become a lot more ‘involved’ in your business during recession times vs. growth times. Giving your banker access to a fairly tight cash model provides a lot of comfort and makes your banker a strong ally during tough times. (HEIDE) Develop a Plan A and Plan B and have specific triggers that would send you to Plan B. In addition, secure working capital now. Always ask for money when you don’t need it because if you ask for it when you need it, you likely won’t get it. I would also ask for more than you think you need. In a downturn cash is what matters most and having access to it will make all the difference. Fortress balance sheet: Reduce debt, build on balance sheet equity, and improve liquidity. The firms that struggle the most in times of downturns are those that are capitalized the least. There is no well to go back to as revenues tighten and earnings suffer. Be prepared and have a strong balance sheet, liquidity, and net worth to manage through a prolonged potential pullback. Preparation reduces stress: Building a fortress balance sheet while pursuing growth can be supported with proper planning. As a business owner, you know your targets and goals for the year. You also know your personal budget and balance sheet. Take time to understand the balance and how you can use the two to reinforce each other. High leverage on both will ultimately leave you weak and at potential risk of failure in the next downturn. Actionable items include maintaining income levels at the company to reinvest earnings into debt repayment or limiting growth based on the earnings and/or cash flow generated from the prior year. Hockey stick growth is not always needed to ensure the strongest organizations survive and thrive. Use your own equity in partnership with debt to invest in new projects while maintaining consistent or lower debt-to-equity levels from year to year. Another planning tool is to manage customer concentrations and ensure that if concentrated, material efforts are being made to diversify the revenue streams to new customers and/or product types. Doing the small things right, make the large things easier: Blocking and tackling efforts often go unnoticed in your day-to-day business, but these small things make your growth and agility easier. Organization, financial reporting, data trends, and infrastructure are not flashy but they can help your business notice segments shrinking or new sales declining in key customer segments/product categories, and provide your business the lead time needed to pivot accordingly. If you can identify these changes and get ahead of them by changing cost infrastructures or making key investments in growing customer segments/product categories it will pay off in spades during a downturn. It may seem complicated, but proper sales tracking in your accounting software, no matter how simple or complex, will allow your management team to make the right moves to maneuver through a slowing economy. (AMY) Think about what opportunities your business might have in a downturn. How can you capitalize in an unsteady market? Recessions are hard, but it can also be the best time to take advantage of a new opportunity or gain market share. We started our business in the recession of 2002. We also survived the recession of 2008 and even invested in a new market that has led to eight years of consecutive growth coming out of that downturn. Q4: What advice do you have for people when it comes to investing in their business over the next 6 months? (HEIDE) Invest according to your plan, and your plan should be based on profitable growth. Month-after-month profitable growth should be every business’ goal. Do not grow just for growth’s sake, but rather in a smart way that grows the bottom line. Invest in things that produce revenue and profits. Do not invest in overhead in hopes of revenue. (AMY) As a Nation and a State, we are very close to full employment. This means you should prepare for turnover and keep ahead of talent needs. Always have a pipeline of individuals that you are cultivating, so when a key role opens, you have a place to start. You can never lose by investing in people, and attracting the right people at the right time in your company. Q5: How is your organization preparing for “resilience” when it comes to an uncertain future? (HEIDE) We watch our numbers like a hawk. Weekly, monthly, quarterly, year-to-date and against plan. We are quick to react and adjust if needed and are always able to do so. You need accurate, timely numbers and financial statements that you understand. I cannot emphasize this enough. In a recession, if you do not have your accounting and finance processes in place and working, by the time you figure out you’re in trouble, it might be too late. (AMY) We keep our mission front of mind and focus on our corporate culture. The resilience of an organization is dependent on the people. Employees are the ones who will bounce back, have great ideas, and help navigate through turbulent times. Each individual is critical in a corporate culture, so identifying and living your corporate values when times are good will help everyone when it is more challenging. Q6: For all of the CEOs, CFOs and leaders reading this, what is one strategy or tactic that you’d suggest they activate now – rather than later? (ANDY) Build a deep understanding of the people in your business and how that impacts the revenue and flow of your company. Business is driven by the people that run them. Building resiliency is the understanding of who among your staff are the key personnel and drivers that do the work that makes the engine turn. Why are they key? And what engages them to keep being a major contributor to your business. Is it the recognition? The money? The challenge? As times get tough, these individuals will be the ones battling with you to find any growth, maintain your existing performance, or manage the pullback needed to sustain and see another boom time. They aren’t always obvious and not necessarily the highest paid but usually loyal, hardworking, and willing to dig in when times are tough. Be sure to have them identified and keep them engaged. (AMY) Focus on your people and your culture. Regardless of market conditions, people who have meaningful work and are inspired by their leaders will outperform those who do not. Also, be opportunistic – market opportunities can always be exposed in good times and bad. AI, automation, and the way people work are changing the game, so if your business acquires the strongest talent in the market you will always be a step ahead.